Whether you are applying for a job or a course, there is a lot of competition out there, in fact there will be tens, if not hundreds of other applicants. When you make an application you have the opportunity to provide supporting documents, like a strong cover letter. To place yourself in the best position to be successful in your application, you should take advantage of this cover letter writing opportunity. Through writing a cover letter you can make sure your application stands out and reflects your passion. Attaching an application letter that your skills and knowledge, could be what secures you an interview. The thought of putting together a strong cover letter can be quite daunting, especially if you aren’t experienced in writing a cover letter. But the fact remains that employers want to see and will often even request an application letter. To help you to get the most out of this opportunity and write a cover letter that makes you stand out, I have put together a list of what to do, and what not to do. Show your passion. The application letter should express your enthusiasm for securing the job or school program. It should make the reader understand why you have chosen to apply and where your inspiration comes from. Show you’re a good fit. The job description will tell you the skills and experience required to make your application successful. Writing a cover letter is your chance to show you meet this criteria. Consider your experience and demonstrate how you have used and/or gained the skills the applications committee are looking for. Say how you will benefit the company/school. You want to show that you are the best choice for the program or job role. You can do this through proving that you will be a benefit to the school or company. Consider your skills and how you can utilise these in the role/program you are applying for and include this in your cover letter writing. Keep your cover letter short and concise. A strong cover letter will be no more than two pages. Just think, there will be lots of applicants and therefore lots to read for those selecting a shortlist. You want to make sure your application letter will be read entirely and is easily memorable. Include information that is not on your CV. As long as it is relevant to the application, include information that you haven’t put on your resume, within your application letter. Make sure this information explains how you are a good fit, or why you are passionate. Remember, a strong cover letter will not be a rehash of your CV. It should be a personal document that fills in the blanks of your resume. Talk yourself up. I’m not saying brag about your accomplishments and tell the reader that you’re the best of the best. But don’t be afraid to sell yourself and certainly don’t sell yourself short. Adapt from a generic cover letter: Write a generic cover letter that displays your best skills. Then as you apply for a new job/program adapt it. Tailor your generic cover letter towards the the role/program you are applying for. Strong cover letters will always look like they have been written especially for that one application. Proofread. Remember to read and re-read your cover letter, checking it for any errors. You might want to think about asking someone else to read it for you. They may be more likely to spot mistakes that your mind inadvertently corrects. Don’t include irrelevant information: Avoid including any information that is not directly relevant to the application. If you include something that might be considered as irrelevant, say how it is relevant. For example, if you want to talk about how great you are at football, talk about the team working and other skills you gained from it. Show how this seemingly irrelevant information, can help you in your studies/new job. Don’t use every example: Though I did say give examples demonstrating where you meet the criteria, limit this to two, maybe three examples, displaying different qualities. Try to summarise all examples into one or two paragraphs. Don’t waffle: Include plenty of information, but keep it concise. Don’t waffle or go off on a tangent, because your target audience may lose interest. 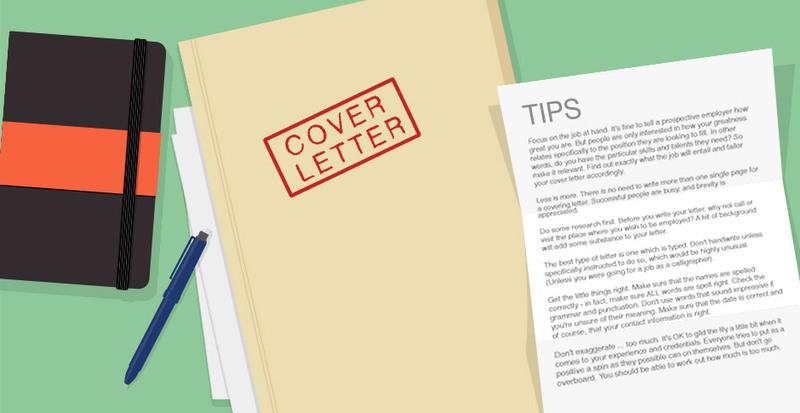 A cover letter should be no more than two pages (that includes half a page of addresses, dates and sign-offs). Follow these guidelines and you should be able to write a cover letter that is strong and secures you an interview. If you struggle to sell yourself, or have difficulty in knowing what to include, consider hiring professional writing service. Services, such as Lisa Thomas Writing Service, can create a professional, high-quality application letter that makes you stand out from the crowd. Alternatively, if you have finished writing a cover letter and would like to have it proofread, these writing services can edit the application letter for you. Contact me to talk about your application letter, or for an idea of my charges, click here. Or see my page of writing services for more information about my CV, Cover Letter and Follow-up Letter writing services.